Quinceañera! The WAAD-WLAN Tea in L.A.
Home > Quinceañera! The WAAD-WLAN Tea in L.A. 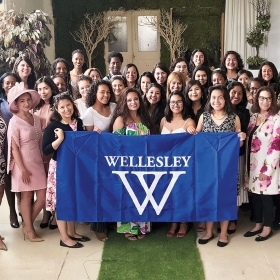 In June, Wellesley alumnae gathered in L.A for the 15th anniversary of the WAAD-WLAN annual tea, which they termed its “Quinceañera”—after the traditional celebration for a girl’s 15th birthday. WAAD is the Wellesley Alumnae of African Descent shared identity group and WLAN is the Wellesley Latina Alumnae Network. “Excuse me, excuse me,” the alum said breathlessly. “Is this the Wellesley tea?” She was a medical resident at UCLA and desperately wanted to join the Wellesley crowd—between shifts. Her surgical mask still around her neck, she apologized profusely for her clothes. “All we could do was cheer for her and hug her,” Arredondo says. “We know we’re so underrepresented, both WAAD and WLAN women, in medicine, and all we could do was [ask], What do you need from us? … We just poured our tea and our heart into her.” The woman, now a practicing physician, attends the teas faithfully, and always volunteers to coach students interested in medicine. This past June was the 15th anniversary of the tea, which alumnae called “Quinceañera”—after the traditional celebration for a girl’s 15th birthday. Representatives of the Alumnae Association and the College—the WCAA’s director of alumnae engagement Lesley Rhodes Robertson ’88, advisor for Latinx students Mared Alicea-Westort, and director of Harambee House Tracey Cameron—flew west to attend. 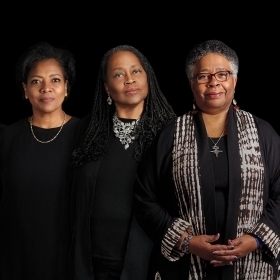 It all started in 1998, before shared identity groups WAAD (Wellesley Alumnae of African Descent) and WLAN (Wellesley Latina Alumnae Network) existed. Arredondo and three friends, feeling far from Wellesley, decided to form what she calls “a band to support each other.” They got together every third Sunday for tea, for hikes, for whatever activities they chose. Several years in, they had the idea to invite other Wellesley alums for an event, and the annual tea was born. Alumnae of color from a wide range of years, current students, and sometimes even prospective students attend. Intentionally held at centrally located venues—to aid accessibility for those without cars—the event usually draws 40–45 people. Organizers work hard to keep costs down and have even made spare dresses available for anyone who wanted them, all in the name of inclusivity. The program focuses on networking. Attendees individually introduce themselves to the full group, and may share a favorite Wellesley memory. At multigenerational tables, they might trade advice with the younger generations. Connections are made; internships, grad school advisors, and job opportunities have been found. And the group strategizes about how to get more alumnae of color involved, whether through admissions work to increase the pipeline of students of color, fund-raising, or participation in SIGs or local clubs. Kathy Silva ’16 has attended the tea since the summer of her junior year. Her first time, she says, “I was able to see myself in the alums that I met, and learning about their careers gave me hope about my own future…. I left feeling empowered and affirmed, and excited to become part of this network myself!” As a result, she became a WLAN board member and is serving as the SIG’s southwest regional representative.